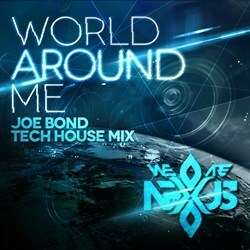 With a distinctive tech house groove, Joe Bond transforms (We Are) Nexus’ “World Around Me” into a rock steady minimalistic style track which is unlike any other remix on the album. Without a doubt, this production from Bond is not the 2 am club-banging sound Nexus fans might be used to but it speaks volumes in its intention as a tech-house track. After the monumental success of their first single "It Feels So Good," Chicago-based EDM act (We Are) Nexus is getting ready for the much anticipated release of their new album, “World Around Me” on January 28th. The album will include sixteen stellar tracks including an original mix and extended mix of “World Around Me” as well as 14 remixes crafted by renowned, chart-topping DJs from around the world including Flatdisk, Wayne G & LFB, Funk Generation / H3DRush and Simone Bresciani to name a few. One track that stands alone and will be sure to impress fans and critics alike is Joe Bond’s “World Around Me” remix. Bond was handpicked by Nexus for his characteristic, deep tech house sound that is unlike anything else on the “World Around Me” album. The Joe Bond mix, while minimalistic in nature, is a stand alone track in approach and is necessary for the album. "Carmen and I wanted to create an album of remixes for "World Around Me" that covered most EDM genres, but we also wanted to have remixes that created a bridge between the remixes allowing for flow and interest without too much repetition. I think we nailed it with Bonds remix. It's placed perfectly and really peaks your interest on the album" says Nick Gunn, producer and composer for (We Are) Nexus. After moving to New York City, Joe Bond became immersed in the club scene after co-founding “Touched by a DJ” and obtaining residency at some of New York City’s hottest clubs including The Limelight, Exit, Liquids Lounge and the Sullivan Room. For the past fifteen years, Bond has been fully immersed in the art of DJing by touring the dance floors of the United Sates, Eastern Europe and Southeast Asia. Bond’s success on the dance floor aligns with his success for the charts. His release entitled “The Way It Feels” made the Beatport Tech House Releases chart at #36. In 2013, Bond also took the coveted #1 spot on Beatport’s Top Mixes chart with his DJ mix “Something Different.” Bond is actively touring and releasing new music as a DJ under Next Music Group management. For those looking for total structure, Joe Bond’s remix of Nexus’ new single may not be your fix, but it certainly has the distinction of being the only tech house style track on the “World Around Me” album. Bond has skillfully built a distinctive mix of organized chaos, layered with classic progressive house color with a strong, deep backbeat. This remix has plenty of breathing room and evolves steadily as the intricacies of intermingled textures show a thoughtful yet complex growth. Without a doubt, this production from Bond is not the 2 am club-banging sound Nexus fans might be used to but it speaks volumes in its intention as a tech-house track. (We Are) Nexus’ new album “World Around Me” will be released on January 28th on iTunes, Beatport and wherever music is sold. The album will include sixteen remixes from prominent remixers in the electronic dance community including DJ Joe Bond. Get in the groove and follow Nexus on Facebook, Twitter and Youtube for updates on “World Around Me” pre-releases, updates and more.